We’d previously posted another bike for sale by this Belgian gentleman and he wanted our readers to have first crack at his current offering before he posts it on eBay. The original 750 SS was based around the round-case, bevel-drive engine and designed to compete in the Formula 750 production-based race series. The bikes finished 1-2 in their inaugural race at the 1972 Imola 200. 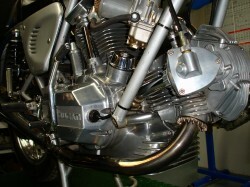 Powered by Fabio Taglinoni’s 748cc V-twin engine, the bike sent its 73 hp through a five speed gearbox. 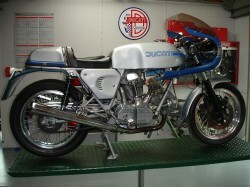 Overhead cams were driven, not by chains or belts, but by a system of tower shafts and bevel gears that gave the “bevel-drive” Ducatis their name. 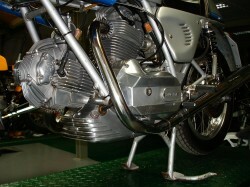 It also featured the famous desmodromic valvetrain used on many of Ducati’s twins and singles. For those unfamiliar, this is a system of cams and rocker arms that both open and close the valves, forgoing traditional valve springs. 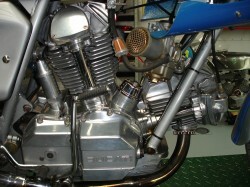 It was intended to eliminate valve-float that can occur at high revs. Modern valve spring technology has made this system somewhat superfluous, but it was effective at the time and remains Ducati’s trademark. 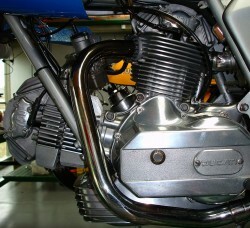 This was the genesis of the classic Ducati V-twin: cylinders splayed at 90 degrees, with the front cylinder nearly parallel with the ground. Twins with this configuration are often referred to as “L-twins”. The engine cases were redesigned in 1973 to have a more angular look and are referred to as “square-case”. Rare model, only about 460 “square case” 750’s were built, so it’s as rare as the Imola Replica. Original bike: correct Borranis, Contis, carbs, etc. Complete Rebuild 10 years ago, about 6,000 summer miles since complete restoration. Superb condition: starts, handles, rides, and sounds like only a real SS’s does. The seller lives in Belgium but can assist with worldwide delivery. 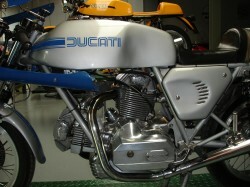 The 750 SS is one of the holiest of holies among Ducati collectors and these bikes are much sought after. Wow – what a gorgeous bike! !